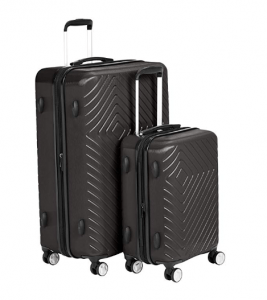 AmazonBasics Geometric (T1937) is an imported hardshell rolling luggage with a lovely monochromatic geometric pattern. It is offered as a two-piece set, a three-piece set or a single 20″, 24″ or 28″ bag. You can purchase it in one of the five color options of black, cream, green, pink and sunset. They are all expandable for additional storage space and come with the integrated TSA locks and double spinner wheels. They have recently been released at Amazon.com but the rating is 4.9 out of 5 stars by 12 customers, which we think is pretty impressive. It is actually a number one new release in luggage sets. No matter what color you choose, even the black will stand out in a crowd of suitcases at the airport terminals. Thanks to the built-in recessed locks that are TSA compatible, the TSA staff at the airport can get into them for security check without breaking the lock. The telescoping handles with the molded grips are adjustable and lock at different points. The spinner wheels that rotate 360 degrees offer you easy maneuverability and great mobility. Inside you’ll find the several zipped sections and cross straps for your clothes, small items, toiletries etc. 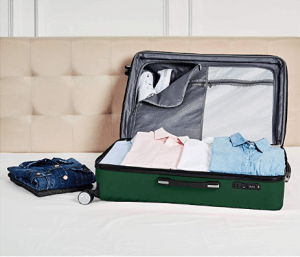 Depending on the length of your business or leisure trip you can travel with one, two or three of these suitcases. You can use the smallest 20″ as a carry-on as it will meet the domestic and global cabin bag luggage restrictions. You have to check in the 24 and 28-inch suitcases prior to your flight. The dual spinner wheels feel very smooth and the suitcases will roll very easily on different grounds. You can navigate through the tight spaces and tun corners very easily and effortlessly without much stress. The exterior is made of sturdy yet lightweight polycarbonate and ABS hardshell materials. So you can have a peace of mind that the contents of your luggage will be kept safe inside the hard plastic. The colors are brighter in the flesh than the photos and the suitcases look good overall. You have the soft rubber handles on the side and the top if you want to lift your luggage comfortably when you’re walking. AmazonBasics Geometric is a good luggage if you travel occasionally, it won’t break easily or on your first trip and should last for a while. But you need to invest a bit more if you travel all the time, hundred times a year. The 20” cabin bag will fit in the overhead bin above you easily, but not under the seat in front of you. Whether you get the Geometric Luggage in one piece, two pieces or three pieces, you’re getting a very nice and modern looking travel product, that is functional, convenient, reliable, safe, sturdy and durable with plenty of storage space.